Twin Lakes Area Chamber & Business Association is hosting the 13th Annual Trees On Parade and Holiday Shopping on Friday December 7th and Saturday December 8th. The event will be held in the Community Center at St. John the Evangelist Church, 701 N. Lake Ave., Twin Lakes on Friday from 4-8 pm Friday and Saturday from 10 a.m. to 5 p.m., Saturday. Admission is $2.00 for adults, $1.00 for ages 3-12 and free for children under 3 years of age. businesses, schools, churches, the library, American Legion Auxiliary and organizations. 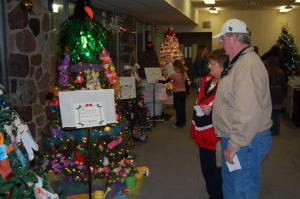 There will be 2 Gingerbread Contest entries by Wilmot High School Culinary Classes. Winners of both contests will be chosen by “People’s Choice” ballots. Don’t forget to vote and place your ballots in the designated ballot boxes before you leave. Everyone receives one ticket to win a fabulous door prize with their admission. Twenty three crafters and retail vendors will be there to help you with your Christmas Shopping. Don’t forget the always popular holiday cookies from Hope Lutheran and Calvary Churches. Food will be served from 4-7 pm on Friday and 11 am until 2 pm on Saturday. Get your raffle tickets to win one of many great raffle prizes from an array of baskets and many vendor donations. There is something for everyone. Win one for yourself or to use as a gift. The Village Tree Lighting will take place Friday Dec. 7th at 5:30pm in the park by the caboose, by Santa and Howard Skinner. At 4:30pm, prior to the tree lighting, New Life Bible Church and Westosha Baptist Church will sing Carols. Then at 5:00pm Wilmot High School Band will play many carols ending with 0 Tannenbaum leading up to the tree lighting. Stop and look at the “Santa Express” Train on display in the park during the event, courtesy of Bob and Linda Breault. As always, Boy Scout Troop 380 will be selling cookies and hot chocolate during the event. Santa will ride by fire truck to St. John’s, courtesy of the Twin Lakes Fire Department and with the assistance of the Twin Lakes Police Department. You don’t want to miss your hometown kick off for the holiday season. Enjoy some time with your family and friends or meet some new friends at this special event. For more information contact the chamber at 262-877-2220 or info@twinlakeschamber.com or click here.